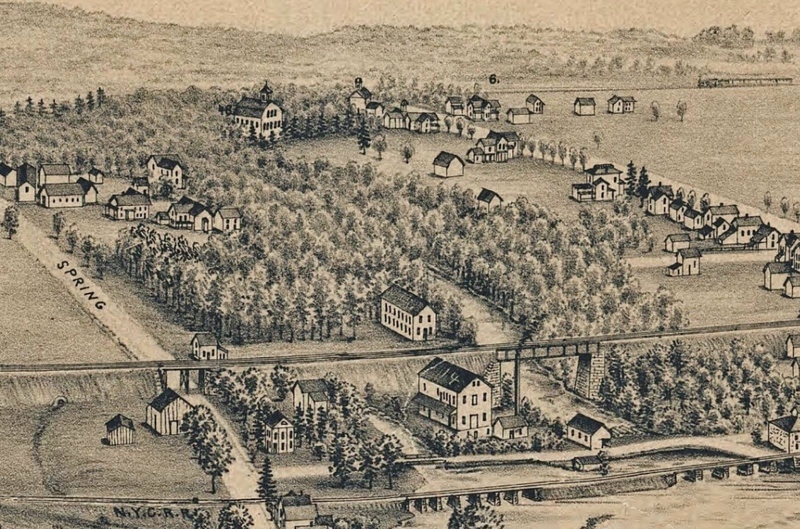 Detail from an 1892 bird's-eye view of Caledonia, NY shows Seth Green's fish hatchery as #46 at top center (click to see full panorama). By this time Seth Green's original operation, built in 1864, had become part of the New York State hatchery system. Pictured inside the frame are both the cold springs enabling Green's trout conservation and some of its prevailing threats: a downstream mill (#12), two railroad lines, and a growing population. According to one biography of Seth Green, there was a widespread, almost “universal ignorance” concerning fish culture within America during his lifetime, the most intelligent of men not excepted (Black 10). Construction of the Caledonia Fish Hatchery in 1864, and Green’s innovative techniques for fish propagation, changed that outlook forever. Yet even as his renown spread beyond Western New York, this first hatchery remained important as a business enterprise and really as a sort of model farm or living museum for anglers, would-be pisciculturalists, and Seth Green fan boys. Green chose Caledonia—and specifically Spring Creek—as the location for the country's first fish hatchery for many reasons. Water from the springs, he wrote, “does not fall below forty-five degrees in winter, nor rise above sixty in the hottest summer weather,” and flowed at a rate of 200,000 gallons per day with little variation even during periods of drought. Relatively level ground surrounding the hatchery meant that very little surface runoff muddied the stream, whose waters looked “pure as crystal.” Altogether, it was “one of the best places we have ever seen for the purpose, and we doubt if it can be equaled” (Trout Culture 86-88). Green is perhaps best known for his technique of dry spawning—whereby a hatchery worker gently squeezes the eggs and milt from spawning females and males, which in a protected environment substantially increases their rate of survival. This is not however where he begins the lessons in his famous 1870 book Trout Culture; rather, it concerns “LOCATION” and a complex range of considerations like the water source and its temperature, its fall over the course of a trout farm, its volume in relation to pond shape and depth, and the material used in constructing races (12-18). All of this reveals the breadth of Green’s careful observations, and his belief that successful pisciculture needed to mimic fish habitat. Trout were well-suited to a locale like Spring Creek, whereas other “rivers, lakes and streams will be abundantly stocked with those fish to which they are best adapted” (9-10). From Caledonia, Green built a successful business of shipping eggs and spawn worldwide (it was not accidental that he chose a location near three different railroads). Lessons in trout-culture were offered at the rate of ten dollars per day, although more often he was called upon to visit some given fishery as a consultant. In 1875, at the overbooked Green’s encouragement, the state of New York purchased his operation and built the structures still there today; he was appointed Superintendent of Fisheries having realized his dream of government assuming responsibility for stocking waterways in a less piecemeal fashion. Walking upstream from the hatchery today, through a surreal landscape toward Caledonia springs, it’s not difficult to feel its unique place in history. --Black, Sylvia R. "Seth Green: Father of Fish Culture." Rochester History 6.3 (July 1944): 1-24. --Green, Seth. Trout Culture. Caledonia, NY: S. Green and A.S. Collins, 1870.